Langer's Deli's famous #19 is their best-selling sandwich since 1947. 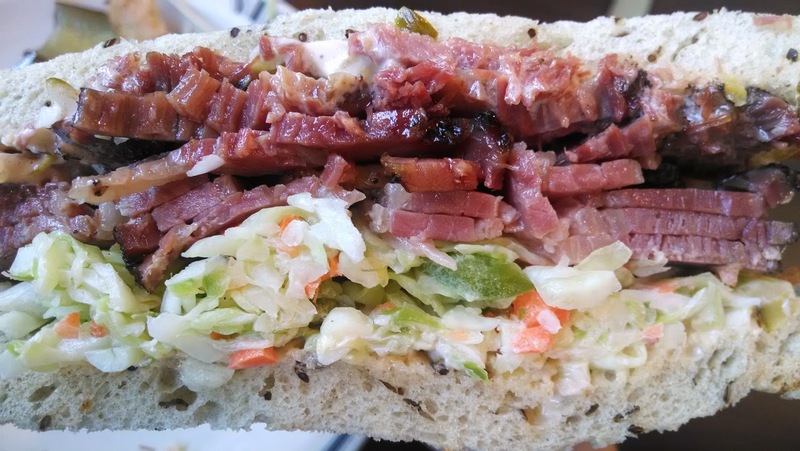 You get moist, tender pastrami marbled with bits of delicious fat, sweet, crunchy cole slaw and soft rye bread (also the best in town). Hands down Langer's serves LA's best pastrami and corned beef sandwiches. I might even argue it's better than what I've had in New York City. And I love that inside the restaurant, you'll see that LA is truly a multicultural mecca with couples, families, friends and co-workers of every shade all enjoying the best Jewish deli food the city has to offer. It's too bad that it's only open until 4pm and it's closed on Sundays. Look at those layers of soft and tender pastrami! The cole slaw is perfect too; it's marinated just right so it doesn't make that fresh rye bread soggy. I will really miss this when I leave LA. This is a sandwich to dream about. Thankfully, they will Fedex their pastrami and rye bread. Protip: Arrive just before Noon to beat the long line that usually snakes outside the entrance. There are even stanchions for crowd control!